Once you’ve gotten the basics down, then before you jump into OCTGN, you should really take the time to watch the OCTGN use tutorial, to understand the basics of using the engine to play efficiently. This will make your first playthrough much more enjoyable. 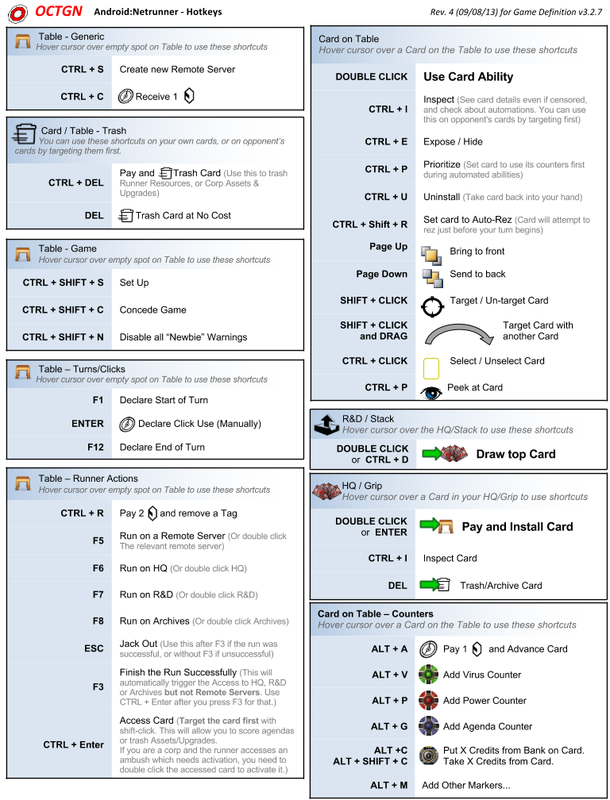 Finally, we suggest you download and have the keyboard shortcuts sheet open while you play. While you can see the same things by right clicking on the tabletop, or a card, it might make things easier to find and get used to. Hi, I created a Netrunner corp deck, saved ok, loaded ok. But when I tried to Set Up a new Game, it told me “Load deck first!” I’m on an older laptop running XP Pro, could that be a problem? Did you remember to load it in game? did you remember to include an ID? New to the game I wonder if one can play a solo game, either according some rules floating around or as 1 player playing both sides. I dunno if you can have 2 sessions on 1 pc with 1 or 2 logins.